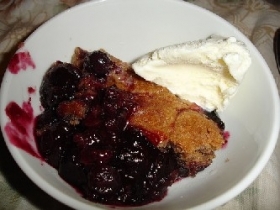 Have you made Apple Blueberry Crumble Pie? 1. 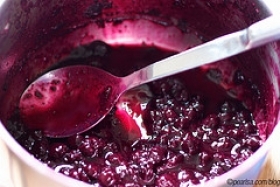 For pastry, place flour, butter, cream cheese and sugar in bowl of food processor; process 15-2o seconds or till dough forms soft ball on blade. 2. Gather into a ball; flatten into disk, if necessary, wrap and chill till firm enough to roll. 3. On lightly floured surface, roll out dough to 1/*" thickness. 4. Chill while preparing filling. 5. 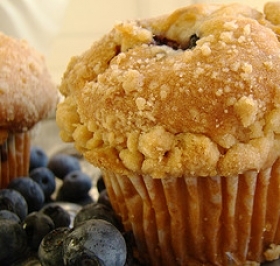 For filling: toss apples and blueberries in bowl with sugar and cinnamon till evenly coated. 6. 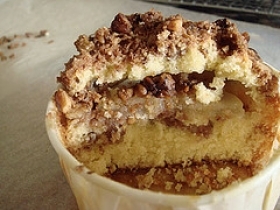 Sprinkle breadcrumbs over bottom of pie shell; fill with fruit mixture, mounded in center. 7. 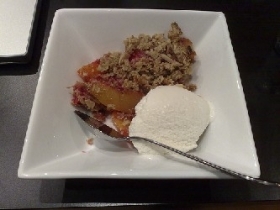 For crumble; combine flour, brown sugar, butter and cinnamon in food processor. 8. 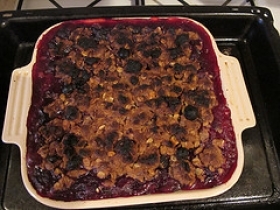 Bake in 400F oven about 45 minutes or till apples are tender and juices are bubbling, shielding with foil if necessary. 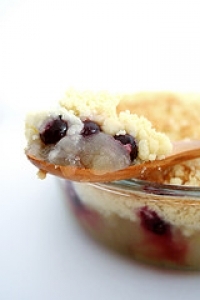 This recipe contains potential food allergens and will effect people with Wheat, Butter, Gluten, Blueberries, Cheese, Natural Sweeteners, Fructose Malabsorption, Apple allergies.